Designed for use with the Hybrex G2 and GDS digital systems, the CT Star CTI software package contains multiple applications. The most important and advanced feature of CT Star is that the design of every application is Internet based. This means with the server/client structure of CT Star you can access your data from anywhere with an internet connection. Allowing complete control over the core programming and setup of Hybrex telephone systems System Manager has been available in progressive form since the early 1990's. 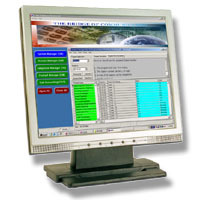 Due to the complexity of today's feature rich Hybrex digital series System Manager is a valuable and time saving tool for the installer and even more so for the maintenance technician. Such personnel using SM can retrieve, modify, and restore system program parameters on the fly. As a PC is used, parameter sets can be archived for example, and the program provides parameter descriptor assistance to the technician. Using SM remote programming support, if required, is a reality. Included in the G2 version of CT Star, System Manager is also available to service personnel as a stand alone application for the Hybrex G1 and G2 series digital systems. The Hybrex GDS series systems, up a level in design and functionality, use an internet browser interface for system management. Access Manager is the software partner of the Hybrex Access Control Phone (ACP). Together they give you the ability to control, monitor, and report access to your premises. Security has become an important aspect of business, and residential activity, and will become more so in the foreseeable future. Access Manager allows for the control of entry to your premises by either entry code or RFID card, automatically logging these events for later report generation if required. Exit can also be logged so reports could take the form of time sheets and access can be controlled according to time of day or week. Report generation can be automated with email despatch to interested personnel. Access manager is also available as a standalone application for the Hybrex G1, G2, and GDS, digital systems. Built on a database structure Contact Manager (CM) allows you to record, retrieve, annotate, and manage your contact information to enhance your business efficiency. A server/client application set CM includes a public (company wide) as well as a personal contact database. Information areas covered by CM include : a comprehensive contacts list, notes related to any contact call or situation, records of activities pending or past, sales data, personal data, benchmarks status, CLI records, and more. All this data is inter-related and integrated with your telephone/LAN network. If CTStar is new to you, or any other time you need to enter pre-existing data, CM allows import of data from Microsoft Outlook to avoid having to re-key. Like its companion application Telephone Manager, Contact Manager is configured for screen pop on incoming calls. This screen pop will be showing the details of your caller, if they are in your database, ready for you to review or add to your most important business asset - your contact database. Used by itself, or with its companion Contact Manager, Telephone Manager (TM) partners your computer with your Hybrex telephone handset. A server / client application set TM provides you with the ability to control your telephone handset from your keyboard, in fact it duplicates your telephone onscreen. The faciltiy of TM goes beyond that however, it also keeps record of your dialled numbers; records the CLI of calls you may have missed whilst not at your desk so you can recall them with a mouse click; allows you to see who is logged onto your network, and intercom or text message them if you desire. Configurable as a screen pop on incoming Telephone Manager is there when you need it, out of the way when you don't. Call Accounting System (CAS) is a server / client application set that complements the Hybrex digital series systems. CAS provides tracking and reporting of all aspects of call traffic through your telephone system. CAS allows statistical and financial analysis of traffic discerned by extension, group, trunk, department, or account code. Call charge methods can be by ISDN advice of charge, meter pulse, polarity reversal, or time based. CAS requires only the entry of your own charging data for a highly accurate call charging system. Call Accounting System is also available as a stand alone application set for the Hybrex G1, G2, and GDS series digital systems. With Hybrex CT Star the feature rich nature of Hybrex digital technology is maximised.